What will happen when I come in for treatment? We’ll ask you to complete some forms that will provide us the necessary background information to enable us to begin your treatment. Then, Dr. Gretchen will sit down with you to discuss your needs. A medical history will be taken, and both a postural evaluation and an orthopedic/neurological exam will be done. You will be asked to perform range-of-motion and other orthopedic tests, which will help rule out different conditions and provide information that will help Dr. Gretchen to proceed with your treatment. The manipulation of vertebrae, the bones that make up your spine, is called an adjustment. Displaced vertebrae can interfere with normal functioning of the primary nervous system that travels along the spine. This distress can be traced from the spine to seemingly unrelated illnesses in any part of the body. Dr. Gretchen uses techniques learned through years of study and experience to realign the bones, thereby reducing irritation to the nerves that may cause muscle tightness and soreness. An adjustment is usually performed by hand while you lie on a special table. Pressure will be applied to various areas of the body, returning the bones to normal functioning position, thereby stabilizing the nerve function and associated muscle attachments. Dr. Gretchen believes in treating each patient as a “whole person”- not simply manipulating the spine. She may prepare you for treatment with muscle work, electro-therapy, ultrasound, intersegment traction, and/or hot or cold packs. These adjunctive therapies (see Pain) may be performed before or afterward to further address associated muscle conditions, resulting in a more complete and effective overall treatment. The spine is not the only part of the body that may become misaligned and stressed. 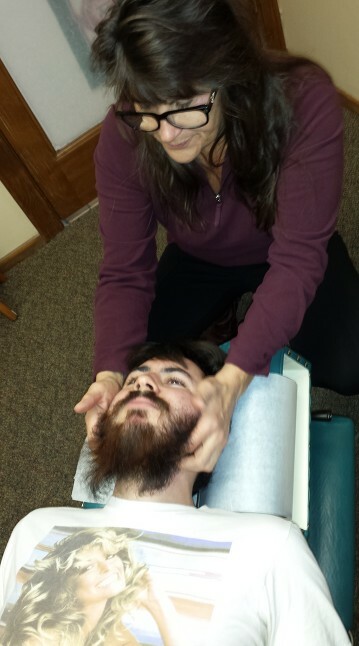 Dr. Gretchen works on elbows, knees, ankles, hips, and even more delicate aspects such as ribs, collarbones, ears, jaw, toes, fingers, and skull. Who can use chiropractic care? Every member of the family is treated at Sandia, from babies and children to pregnant women and grandparents. Each has their special set of conditions. Auto accidents and on-the-job injuries often bring someone in for treatment, but the daily stress and lifestyle also are addressed. Dr. Gretchen will work with you to evaluate your habits, discuss possible dietary and nutritional needs, and teach you home stretching and strengthening exercises to rehabilitate the neuro-muscular-skeletal system. Children can suffer spinal stress as early as birth, so children should be checked for spinal alignment whether they exhibit symptoms. As a mother of two sons, Dr. Gretchen sees firsthand the need for children to receive regular chiropractic care. If your child is more irritable than usual, a visit to the chiropractor should be the next step. Bed-wetting, for example, is a childhood problem that often responds well to chiropractic. Childhood problems such as scoliosis, headaches, earaches, stomachaches, sore throats, asthma, insomnia, excessive crying, loss of appetite, bed-wetting, and hyperactivity also may be related to misalignment of the spine. Sandia Chiropractic will bill all insurance companies offering chiropractic coverage. We ask that you take care of deductible and co-pay amounts as they arise. For a more detailed discussion and explanation of other financial arrangements, ask for our “Financial Policy” brochure.We are providers for Presbyterian, Blue Cross Blue Shield, & Medicare. Take your health to the next level the natural way. Dr. Gretchen and staff look forward to working with you.